M - Mature size 16" x 36"
7" x 5" powder blue green thick leaves edged with creamy white margins that age to white. 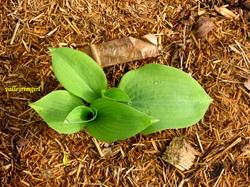 In fall the leaf centers become a rich green. 8-10 pairs of veins. Pale lavender flowers. Awards: Benedict Garden Performance Honorable Mention 2009, Benedict Garden Performance Award of Merit 2010, American Hosta Growers Hosta of the Year 2010. L - Mature size 30" x 65"
9-11" long x 7-8" wide dark blue-green lightly cupped, heavy textured, corrugated leaves with 1" wide even margin that is creamy yellow aging to pure white. Good substance. 12 pairs of veins. The pale lavender flowers are held 38" above the clump. Awards: Benedict Garden Performance Honorable Mention 2007, Benedict Garden Performance Award of Merit 2010. 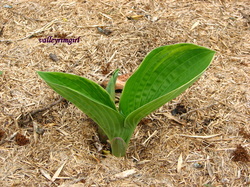 Picture taken on June 6, 2009 just as it was emerging. SM - Mature size 18" x 40"
5" x 3" smooth textured heavily substanced heart shaped vigorous grower of powdery blue leaves. Foliage turns bright blue from mid June to mid July. Very fragrant light lavender blue flowers on 20" scapes. 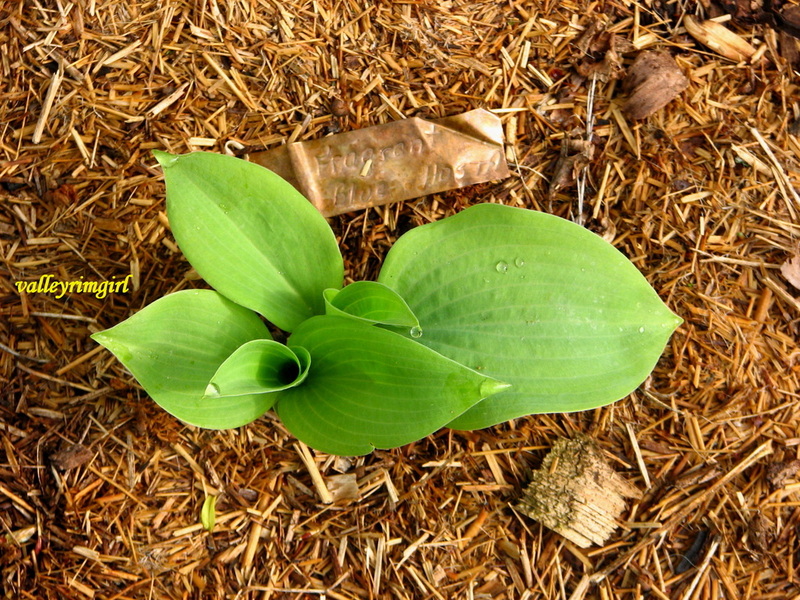 Picture taken on June 10, 2009, just as emerging. ML - Mature size 22" x 48"
8" x 6" wavy, variegated apple green leaves with broad irregular creamy yellow margins. Large white to pale lavender very fragrant flowers on 36" scapes. Sun tolerant. 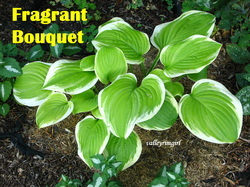 Awards: American Hosta Growers Hosta of the Year 1998, Benedict Garden Performance Honorable Mention 2012. 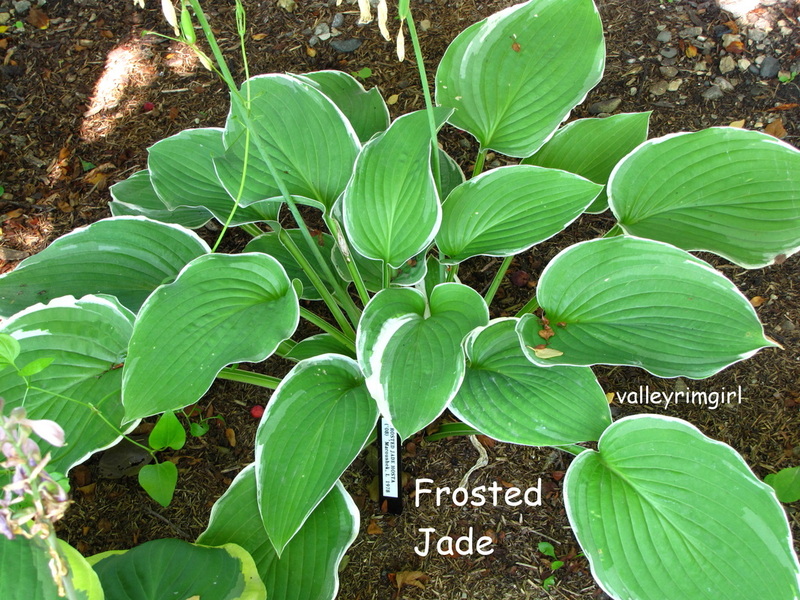 G - Mature size 30" x 60"
13" x 9" thin neat white edge on dark frosty green leaves. 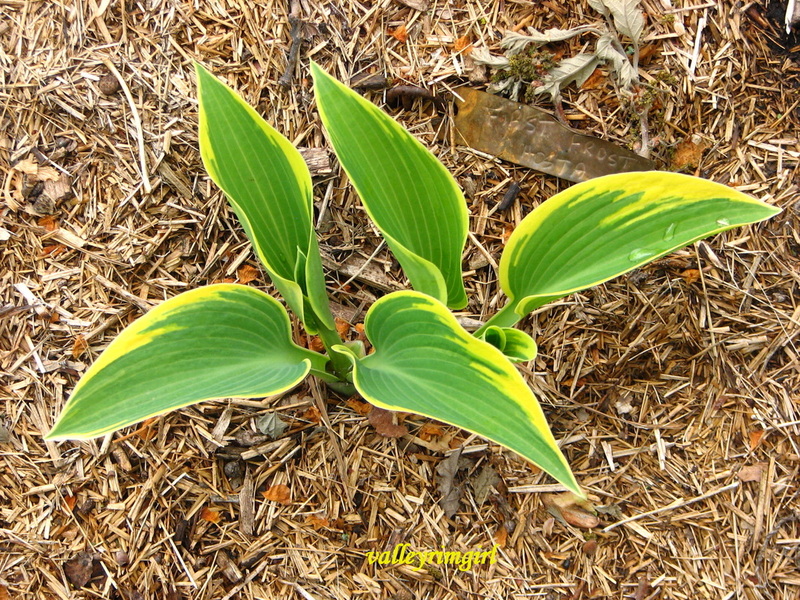 Attractive lighter grey green streaks radiate from margin. 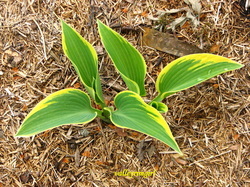 The erect leaves have a waxy, frosted coating similar to that on many blue hostas but probably not found on any other variegated green cultivars. 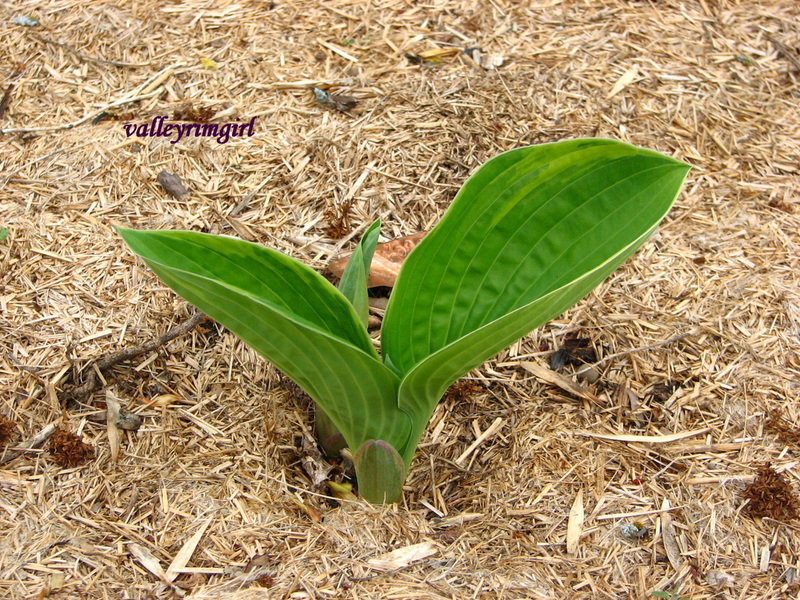 A neat piecrust edge shows as the plant matures. Medium lavender flowers on 42" scape. Awards: AHS ALAHOSO Bowl 1989, AHS Eunice Fisher Award 1989, Benedict Garden Performance Honorable Mention 2009, Benedict Garden Performance Award of Merit 2010. 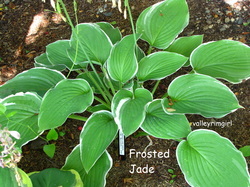 This picture was taken in the summer of 2011 of my 3 year old Frosted Jade.